Motorola Android Turbo2 32GB Verizon and GSM Unlocked, Soft White (Refurbished). Moto ShatterShieldTM is the world's first smartphone display guaranteed not to crack or shatter. Because you deserve a phone that won't let you down. Enjoy your phone for longer without stopping to recharge. The Droid Turbo 2 lasts up to two full days† on a single charge. When it's time to plug in, get the fastest charging available on a smartphone. TurboPowerTM gives your Droid Turbo 2 up to 13 hours of battery life in just 15 minutes Picture-perfect moments can pass in a flash. The Droid Turbo 2's 21-megapixel camera features rapid focus with zero shutter lag to shoot crystal-clear photos and amazing HD video. The front-facing 5-megapixel camera with a flash features a wide-angle lens, which is great for fitting everybody in the picture. 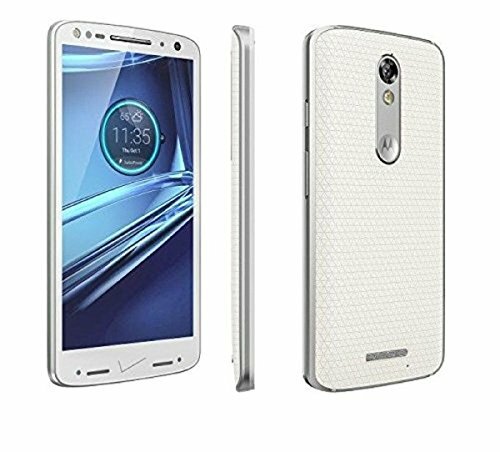 The Droid Turbo 2 moves quickly from email to app to web and back again with the Qualcomm® SnapdragonTM 810 processor with 2.0 GHz octa-core CPUs, all on a 5.4-inch Quad HD display.